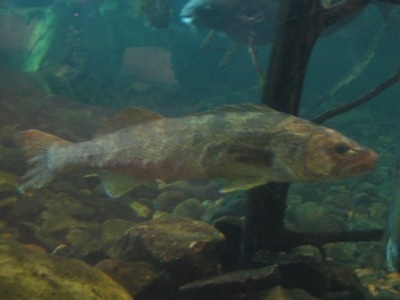 The walleye is the largest member of the perch family, which includes sauger, yellow perch, and darters. This species can be recognized by its torpedo-shaped body, forked tail, white spot on its lower tail fin, sharp canine teeth, and reflective eyes. The luminous appearance of the eyes is due to the tapetum lucidum, a layer of pigment that helps the fish to see at night or in murky water. Body coloration ranges from dark olive brown to yellowish gold, with brassy flecks on its sides. Walleyes are native to central North America and Canada, including the Ohio River and Great Lakes watersheds. These popular sport fish have been extensively stocked throughout much of North America. Walleye typically weigh around 1-2 pounds, although trophy catches may exceed 15 pounds and lengths of 36 inches or more. The walleye is the provincial fish of Saskatchewan, Canada and the U.S. states of Minnesota and Vermont. Walleye are known by a variety of regional names including pickerel, walleye pike, and others.